It’s common to watch improvisational comedy or be involved in a spontaneous game of softball, but have you ever thought that quilting could be equally spur-of-the moment? Please welcome Nancy’s guests Weeks Ringle and Bill Kerr, masters at improvisational piecing with one inch strips. Bill and Weeks of Modern Quilt Studio will share their technique from their book Magic Inch Quilts on Sewing With Nancy. In part one of the Sewing With Nancy series, Magic Inch Quilts, Bill will share how he and wife, Weeks, like to begin a quilting project with an overall plan but make individual design decisions as they go along, as opposed to having a specific design that they follow inch by inch. Their quilt, Chorus Line, is the ideal quilt to begin this series. The rows of 1″ strips gradate from numerous to few and give the impression of a Broadway musical’s grand finale. 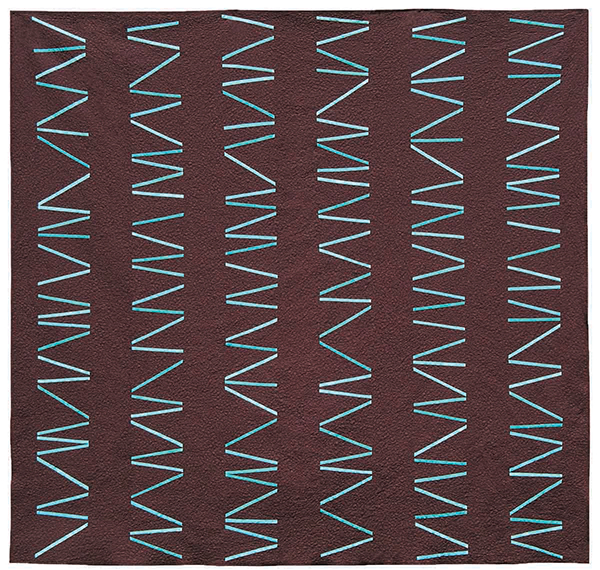 Bill will show you how to create this modern quilt design. Working in columns is a fun and fast way to tackle our next quilt, Splice of Life, in any size. You’ll love the freedom of choosing the number of splices and the spacing of them to make this quilt your own. Choose two colors for a graphic quilt similar to the one shown here or dig into your stash for a scrappy version. See how we create these quilts with sewing demonstrations on Sewing With Nancy. Watch it online, today. Find your copy of Magic Inch Quilts at Nancy’s Notions. Watch Magic Inch Quilts on Sewing With Nancy online. For a chance to win a copy of Magic Inch Quilts from Modern Quilts Studio, leave a comment sharing your answer to: What is smallest fabric scrap you save? Please join us this week for The Nancy Zieman – The Rest of the Story Book Blog Tour with a few of Nancy’s friends. View the Schedule of Blog Postings, read book reviews and insights from featured bloggers, and sign up for book giveaways! I am quilty of saving scraps as small as an Inch. Smaller than that I save in a bag to give to a group that makes dog and cat beds for the shelters here. I have two bins. One for fabric and the other for rubbish. I’m trying to keep my options open because I haven’t tried everything yet. I save all fabric scraps and all pieces of thread and ribbons as well as scraps of water soluble stabilizer. Someday I hope to make a free form multi media quilt using all the scraps. There is a lot of wasted thread generated in machine embroidery. I keep little baskets under my machines and cutting tables to catch the threads and fabrics and a separate one for the stabilizer. I have used some of the scraps in “designing” inspirational lavender sachets . My mother repurposed so many things and having these collections reminds me of her. The quilt will be dedicated to her. Some days I save everything, some days I don’t have time to take care of them and toss them in the trash. I don’t have any rule about what I save. If I think a scrap is useable then most likely I save it. I smallest pieces that I save are strips at least an inch wide and squares of 2.5 inches. I have enjoyed reading the comments and think I should use scraps for Granddaughter dresses! I save scraps that may only be 2 to 3 inches wide. I have done some paper pieced quilting where you can use really small pieces and I really just hate throwing away fabric, if I think it can possibly be used for something. My stash of fabric scraps in enormous! A definite reason to save all those scraps! Every time I get ready to throw some away, I think “can I use that for a project”. I like Lynn’s idea of the small scraps in the mason jar to display, so… there’s another reason to save those tiny scraps! I really am a fabric saver as I save anything 3/4″ or larger. I love working with small pieces. It’s the big pieces that puzzle me sometimes! I keep nearly all sizes for my scrappy quilts and landscape too. I love the magic inch quilts, it looks like it would be fun to make. I save a lot of scraps, but nothing smaller than 1 1/2 inches; any smaller there is nothing left to see after sewing. I make crumb or string blocks 6 1/2 inches square; I made a lot of them, so I should think of a quilt design and sew them together. I don’t have any pieces that are “too” small. I often sew for charity and small pieces add color. If I have any type of fabric, such as selvages, I put them in dog beds for the local human society. With the price of fabric today, I try to use it all! I don’t throw away anything. I cut 1.5 inches off the selvage to make log cabin quilt and string quilts. The smaller pieces are pieced and cut into 5″ blocks. The tiniest crumbs are stuffed into pillow cases for pet pillows. The smallest pieces I save are about an 1″ wide. I use the small pieces when doing fusible applique. They come in handy for floral stems or petals. They also come in handy as a leader fabric when chain piecing. I save everything no matter how small. I use bits of thread, fabric, ribbon, etc to create new fabric. I sandwich a pile of scraps between 2 layers of water soluble stabilizer and then free motion quilt all of the bits together. Wash and voila! New fabric! I have been saving all sizes of scraps but after reading this comments, I think I will toss the smaller ones. I do use them to make cards so a seam allowance isn’t critical. I save some pretty small pieces, maybe about 1/4″ wide because of applique work. You never know when you need just that little bit for an eye or an accent! I don’t know the smallest size of scrap, but I’m starting to collect a lot of them. My sewing stash of scraps has been used over the years to mend, alter and add to clothing. I also use my scraps for fun projects like quilts and household items. I usually keep scraps at least 4″×4″. Anything smaller does not “cut it” for me. I’m always looking for ideas to use with my high school students in sewing class. This quilt book would be a wonderful way to make a quilt as a group project. I keep EVERY bit of 100% cotton fabric of any size! I cut down to 1.5″ or 2.5″ squares or strips to store by dominate color in a divided plastic tray if my leftover scrap piece is smaller than 3″. Anything smaller than 1.5″ is put into a clear ziplock bag for future use as either stuffing for a cloth toy or pillow OR for improvisational scrap piecing to make scrappy “modern” borders or appliques. As a certified fabric and scrap hoarder, any and all scraps are saved for creating confetti quilts, including all selvages which are used for other quilt projects. A copy of Magic Inch Quilts would be great addition to add to my growing quilt library. The smallest ones that I can’t use I put in mason jars for bits of color on my shelves. I save every scrap of fabric even the selvages which can be used in word quilts and as accents in art quilts. The smallest of fabric scraps are saved for the quilts they came from when mending tears is needed. The smallest scraps I have are 3/4″ x 3/4″. I use them for miniature quilts. I keep them all in a desk size stacked plastic container with 3 drawers. I **love** scraps, almost more than yardage! 1.5″ is a favorite size. I created an Irish Chain with many of them… and would love to make the “Chorus Line” strip quilt… I probably have enough 1.5″ strips! It would certainly go faster than all those 1.5″ squares! I keep anything about an inch wide–including selvedges. I save pieces that are 6″ square in a box and the smaller scraps in a bag to use as stuffing for the bottom of primitive dolls to give them weight. Unless something falls on the floor and gets caught in the wheels of my chair, I use it all. I occasionally save 1″ strips if I can forsee that I’d use in an improv quilt that needs a little zing. I just finished a very vibrant quilt (oranges, yellows, magentas) and have kept some of these small scraps. I plan to make a foundation scrappy quilt so I save any size scrap that I think would be used to complete a 12 x 12 pieced square. Everything! I use up to 1-inch strips for rug hooking, anything smaller goes to a friend for dog bed filling. I save 2″ squares/ strips and larger for quilting and smaller than 2″ or more narrow for crafting. This lesson is a fine way to use up those smaller pieces in and innovative and modern quilting way. I try to save all my scraps. There isn’t much I throw away since I do embroidered applique as well as quilting and have found use for very small pieces. I keep my small scraps in a tub. I save everything because I do a lot of applique and no scrap is too small! I learned a long time ago that as soon as I throw a small piece of fabric away, I find a need for it. I keep my scraps separate from fat quarters, etc. and sort them by color. I keep 2.5 inch strips and anything bigger than a 6″ square. If it’s big enough for something to show after the two seam allowances I save it. I save nothing smaller than 2 inch square, sometimes do a hs triangle for 1 and a half square. I save everything, but then when I want to use that material I will go through it and I do not save less than two inches. I know I should do it when I’m finished using it from the beginning, I’m lazy and in a hurry to see the next new piece of material. I save 1 1/2″ selvages and 2″ squares for a variety of projects. one inch strips and 2 inch squares. I keep the squares in a container by my machine so I can sew them together as I collect them. the strips I color code in pockets of an over the door shoe organizer. I save almost everything. I like to make circle log cabins that require 3/4” strips, and have made snippet blocks which you use literally tiny pieces on water soluable stabilizer. Guess you could call me a hoarder of scraps! I save most of my scraps. I do applique and I also use them to stuff small animals. Can’t wait to try this quilt. I save all my scraps! Lol, sometimes look back and wonder why?!!! Seems they always fit into something though! I need to start a selvage quilt, been saving selvages for years! I stick to scraps about 2 1/2 inches. My mom will save them at like 1 inch. If I have anything left from a cut of fabric, it is saved! From the selvage to a tiny snippet of fabric, it gets saved. These scraps can be used for anything from appliqué to stuffing. There is no scrap too small to save when you love applique like I do. I never know when I will need a bird’s eye, or a beak, a skinny little leg, or an accent. And if I have a small piece to use, it keeps me from cutting into my beautiful yardage that I need for piecing. I love to applique!! So all scraps 3 inches and above are saved. I have a large basket for these. Great for scrappy projects. Thanks for inspiration!! This was one of my favorite shows! I save strips at least 2” wide and 8” long for string quilts. I also save small 2-3” wide strips 4” or so for making rows of scrappy strips by sewing on adding machine paper. I think scrappy quilting is my favorite kind!